Michael Faraday was born on September 22, 1791 in London, England, UK. He was the third child of James and Margaret Faraday. His father was a blacksmith who suffered poor health. Before marriage, his mother had been a servant. The family lived in a degree of poverty. Michael Faraday attended a local school until he was 13, where he received a basic education. To earn money for the family he started working as a delivery boy for a bookshop. He worked hard and impressed his employer. After a year, he was promoted to become an apprentice bookbinder. Michael Faraday was eager to learn more about the world – he did not restrict himself to binding the shop’s books. After working hard each day, he spent his free time reading the books he had bound. He became so fascinated that he started spending part of his meager pay on chemicals and apparatus to confirm the truth of what he was reading. As he learned more about science, he heard that the well-known scientist John Tatum was going to give a series of public lectures on natural philosophy (physics). To attend the lectures the fee would be one shilling – too much for Michael Faraday. His older brother, a blacksmith, impressed by his brother’s growing devotion to science, gave him the shilling he needed. It is worth saying that the parallels in the lives of Michael Faraday and Joseph Henry are rather striking. Both were born in poverty; had fathers who often could not work because of ill-health; became apprentices; were inspired to become scientists by reading particular books; were devoutly religious; became laboratory assistants; their greatest contributions were made in the same scientific era in the field of electrical science; and both have an SI unit named in their honor. Faraday’s education took another step upward when William Dance, a customer of the bookshop, asked if he would like tickets to hear Sir Humphry Davy lecturing at the Royal Institution. Sir Humphry Davy was one of the most famous scientists in the world. Faraday jumped at the chance and attended four lectures about one of the newest problems in chemistry – defining acidity. He watched Davy perform experiments at the lectures. This was the world he wanted to live in, he told himself. He took notes and then made so many additions to the notes that he produced a 300 page handwritten book, which he bound and sent to Davy as a tribute. An 1802 drawing by James Gillray of another exciting science lecture at the Royal Institution! Humphry Davy is the dark-haired man holding the gas bag. At this time Faraday had begun more sophisticated experiments at the back of the bookshop, building an electric battery using copper coins and zinc discs separated by moist, salty paper. He used his battery to decompose chemicals such as magnesium sulfate. 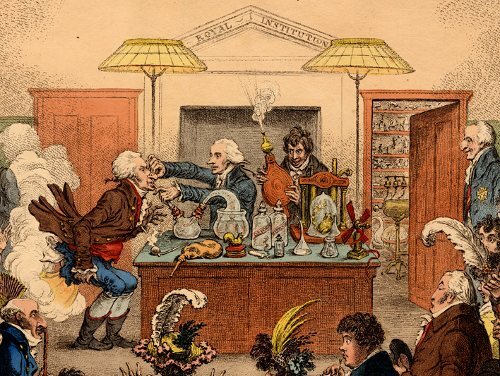 This was the type of chemistry Humphry Davy had pioneered. In October 1812 Faraday’s apprenticeship ended, and he began work as a bookbinder with a new employer, whom he found unpleasant. And then there was a fortunate (for Faraday) accident. Sir Humphry Davy was hurt in an explosion when an experiment went wrong: this temporarily affected his ability to write. Faraday managed to get work for a few days taking notes for Davy, who had been impressed by the book Faraday had sent him. There were some advantages to being a bookbinder after all! When his short time as Davy’s note-taker ended, Faraday sent a note to Davy, asking if he might be employed as his assistant. Soon after this, one of Davy’s laboratory assistants was fired for misconduct, and Davy sent a message to Faraday asking him if he would like the job of chemical assistant. Would he like the job? Working in the Royal Institution, with one of the most famous scientists in the world? There could only be one answer! 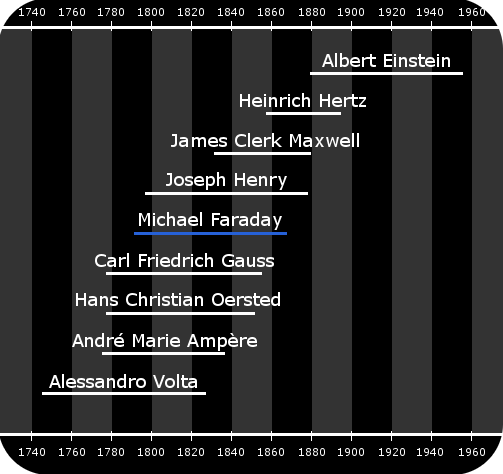 Faraday’s lifetime and the lifetimes of related scientists and mathematicians. Faraday began work at the Royal Institution of Great Britain at the age of 21 on March 1, 1813. His salary was good, and he was given a room in the Royal Institution’s attic to live in. He was very happy with the way things had turned out. He was destined to be associated with the Royal Institution for 54 years, ending up as a Professor of Chemistry. His first job was as a chemical assistant, preparing apparatus for experiments and lectures. This involved working with nitrogen trichloride, the explosive which had already injured Davy. Faraday himself was knocked unconscious briefly by another nitrogen chloride explosion, and then Davy was injured again, finally putting to an end to work with that particular substance. After just seven months at the Royal Institution, Davy took Faraday as his secretary on a tour of Europe that lasted 18 months. Faraday met many of Europe’s greatest scientists, including Alessandro Volta, pictured above. During this time Faraday met great scientists such as André-Marie Ampère in Paris and Alessandro Volta in Milan. In some ways, the tour acted like a university education, and Faraday learned a lot from it. He was, however, unhappy for much of the tour, because in addition to his scientific and secretarial work, he was required to be a personal servant to Davy and Davy’s wife, which he did not enjoy. Davy’s wife refused to treat Faraday as an equal, because he had come from a lower class family. In 1816, aged 24, Faraday gave his first ever lecture, on the properties of matter, to the City Philosophical Society. And he published his first ever academic paper, discussing his analysis of calcium hydroxide, in the Quarterly Journal of Science. In 1821, aged 29, he was promoted to be Superintendent of House and Laboratory of the Royal Institution. He also married Sarah Barnard. He and his bride lived in rooms in the Royal Institution for most of the next 46 years: no longer in attic rooms, they lived in a comfortable suite Humphry Davy himself had once lived in. In 1824, aged 32, he was elected to the Royal Society. This was recognition that he had become a notable scientist in his own right. In 1825, aged 33, he became Director of the Royal Institution’s Laboratory. 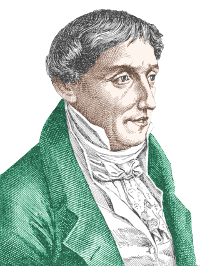 In 1833, aged 41, he became Fullerian Professor of Chemistry at the Royal Institution of Great Britain. He held this position for the rest of his life. In 1848, aged 54, and again in 1858 he was offered the Presidency of the Royal Society, but he turned it down. It would be easy fill a book with details of all of Faraday’s discoveries – in both chemistry and physics. It is not an accident that Albert Einstein used to keep photos of three scientists in his office: Isaac Newton, James Clerk Maxwell and Michael Faraday. Funnily enough, although in Faraday’s lifetime people had started to use the word physicist, Faraday disliked the word and always described himself as a philosopher. He was a man devoted to discovery through experimentation, and he was famous for never giving up on ideas which came from his scientific intuition. If he thought an idea was a good one, he would keep experimenting through multiple failures until he got what he expected; or until he finally decided that Mother Nature had shown his intuition to be wrong – but in Faraday’s case, this was rare. This is a glimpse of what would eventually develop into the electric motor, based on Hans Christian Oersted’s discovery that a wire carrying electric current has magnetic properties. Faraday’s electromagnetic rotation apparatus. Electricity flows through the wires. The liquid in the cups is mercury, a good conductor of electricity. In the cup on the right, the metal wire continuously rotates around the central magnet as long as electric current is flowing through the circuit. In 1802 John Dalton had stated his belief that all gases could be liquefied by the use of low temperatures and/or high pressures. 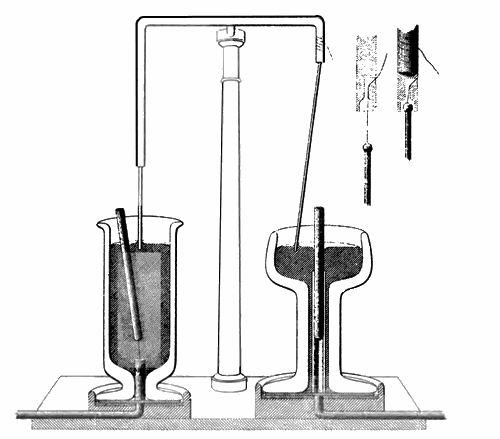 Faraday provided hard evidence for Dalton’s belief when he used high pressures to produce the first ever liquid samples of chlorine and ammonia. Showing that ammonia could be liquefied under pressure, then evaporated to cause cooling, led to commercial refrigeration. The ammonia liquefaction was of further interest, because Faraday observed that when he allowed the ammonia to evaporate again, it caused cooling. The principle of cooling by artificial evaporation had been demonstrated publicly by William Cullen in Edinburgh in 1756. Cullen had used a pump to reduce the pressure above a flask of ether, causing the ether to evaporate quickly. The evaporation caused cooling, and ice formed on the outside of the flask as moisture from the air came into contact with it. The importance of Faraday’s discovery was that he had shown that mechanical pumps could transform a gas at room temperature into a liquid. The liquid could then be evaporated, cooling its surroundings and the resulting gas could be collected and compressed by a pump into a liquid again, then the whole cycle could be repeated. 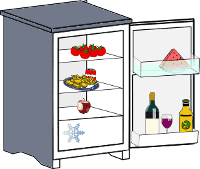 This is the basis of how modern refrigerators and freezers work. In 1862 Ferdinand Carré demonstrated the world’s first commercial ice-making machine at the Universal London Exhibition. The machine used ammonia as its coolant and produced ice at the rate of 200 kg per hour. 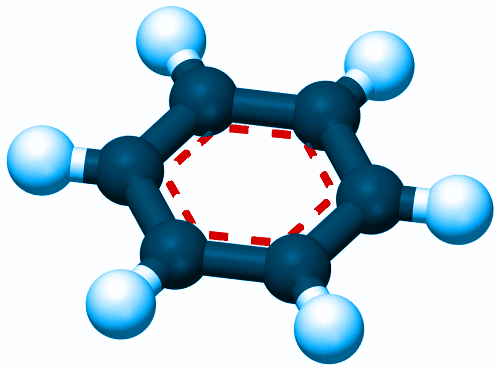 Historically, benzene is one of the most important substances in chemistry, both in a practical sense – i.e. making new materials; and in a theoretical sense – i.e. understanding chemical bonding. Michael Faraday discovered benzene in the oily residue left behind from producing gas for lighting in London. A model of a benzene molecule. This was an enormously important discovery for the future of both science and technology. Faraday discovered that a varying magnetic field causes electricity to flow in an electric circuit. Moving the magnet causes a current to flow. You need a sensitive ammeter to observe the tiny current caused by a small magnet. The stronger the magnet, the bigger the current. Pushing a bar magnet into a coil of wire can generate a larger current. For example, moving a horseshoe magnet over a wire produces an electric current, because the movement of the magnet causes a varying magnetic field. Previously, people had only been able to produce electric current with a battery. 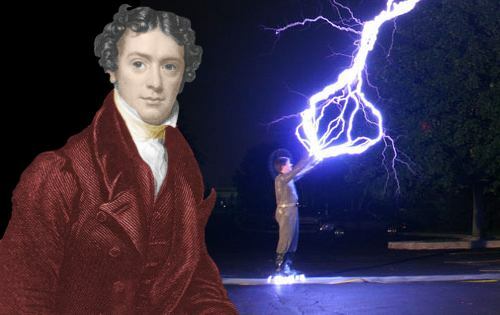 Now Faraday had shown that movement could be turned into electricity – or in more scientific language, kinetic energy could be converted to electrical energy. Most of the power in our homes today is produced using this principle. Rotation (kinetic energy) is converted into electricity using electromagnetic induction. The rotation can be produced by high pressure steam from coal, gas, or nuclear energy turning turbines; or by hydroelectric plants; or by wind-turbines, for example. Faraday was one of the major players in the founding of the new science of electrochemistry, which studies events at the interfaces of electrodes with ionic substances. 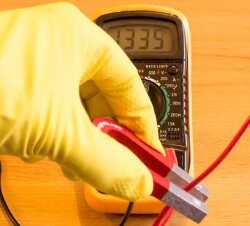 Electrochemistry is the science that has produced the Li ion batteries and metal hydride batteries capable of powering modern mobile technology. Faraday’s laws are vital to our understanding of batteries and electrode reactions. Faraday discovered that when any electric conductor becomes charged, all the extra charge sits on the outside of the conductor. This means that the extra charge does not appear on the inside of a room or cage made of metal. The image at the top of this page shows a man wearing a Faraday Suit, which has a metallic lining, keeping him safe from the electricity outside his suit. In addition to offering protection for people, sensitive electrical or electrochemical experiments can be placed inside a Faraday Cage to prevent interference from external electrical activity. Faraday cages can also create dead zones for mobile communications. 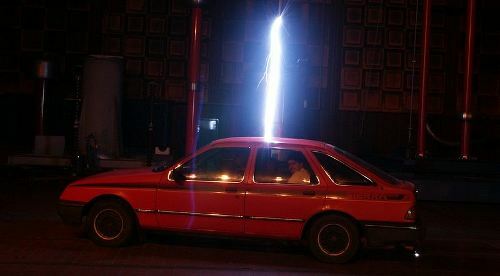 Here a car’s metal body is acting as a Faraday Cage, protecting the occupants from the electric discharge. This was another vital experiment in the history of science, the first to link electromagnetism and light – a link finally described fully by James Clerk Maxwell’s equations in 1864, which established that light is an electromagnetic wave. Faraday discovered that a magnetic field causes the plane of light polarization to rotate. Faraday is, and must always remain, the father of that enlarged science of electromagnetism. Most people are familiar with ferromagnetism – the type shown by normal magnets. The frog is slightly diamagnetic. The diamagnetism opposes a magnetic field – in this case a very strong magnetic field – and the frog floats because of magnetic repulsion. Image by Lijnis Nelemans, High Field Magnet Laboratory, Radboud University Nijmegen. Faraday discovered that all substances are diamagnetic – most are weakly so, some are strongly so. Diamagnetism opposes the direction of an applied magnetic field. For example, if you held the north pole of a magnet near a strongly diamagnetic substance, this substance would be pushed away by the magnet. Diamagnetism in materials, induced by very strong modern magnets, can be used to produce levitation. 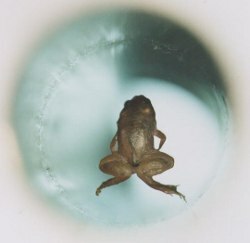 Even living things, such as frogs, are diamagnetic – and can be levitated in a strong magnetic field. Michael Faraday died aged 75 on August 25, 1867 in London. He was survived by his wife Sarah. They had no children. He had been a devout Christian all of his life, belonging to a small branch of the religion called Sandemanians. During his life, he was offered burial in Westminster Abbey along with Britain’s kings and queens and scientists of the stature of Isaac Newton. He turned this down, in favor of a more modest resting place. His grave, where Sarah is also buried, can still be seen in London’s Highgate Cemetery. Nature is our kindest friend and best critic in experimental science if we only allow her intimations to fall unbiased on our minds. The more we study the work of Faraday with the perspective of time, the more we are impressed by his unrivalled genius as an experimenter and natural philosopher. When we consider the magnitude and extent of his discoveries and their influence on the progress of science and industry, there is no honour too great to pay to the memory of Michael Faraday – one of the greatest scientific discoverers of all time. They appear to us to be almost prophesies, because we have now seen that light can in fact be magnetized, and… in nature itself, in the northern lights, an example of illumination of the magnetic lines of force of the Earth by the electrons escaping from the sun. "Michael Faraday." Famous Scientists. famousscientists.org. 24 Nov. 2014. Web.